Here is the "Complete Media Day Coverage" video including the entire media day ceremony, more off-ride shots of the coaster, and the complete pre-show. Enjoy! Valencia, CA, October 22, 2008 /PRNewswire/ — Six Flags Magic Mountain announced today the addition in 2009 of a new wooden roller coaster to its world renowned coaster collection. Developed by the same team that produced the new X2 experience, TERMINATOR®: THE COASTER will combine innovative thrill ride technology with the signature science fiction punch of the Terminator brand. The debut is scheduled to coincide with the release of the McG directed film Terminator Salvation™ next year, and will introduce fans to an entirely new universe inspired by the film's post apocalyptic setting. "Our mission at Six Flags Magic Mountain is to provide entertainment that appeals to a wide range of tastes and this specially designed wooden coaster will be a proven winner among guests of all ages," said Jay Thomas, Six Flags Magic Mountain's Park President. "Designed around the theme of the successful Terminator movie brand, this ride will draw thrill seekers from around the world." Derek Anderson and Victor Kubicek, co-CEO's of The Halcyon Company, credit Six Flags with taking the ride to the next level in adventure. "The combination of the universe created by the film and the setting of this ride will provide fans with an adventure that keeps the spirit of the story," said Kubicek and Anderson jointly. The $10 million coaster, engineered exclusively for the Valencia theme park by Great Coasters International Inc. (GCII), TERMINATOR®: THE COASTER will feature a loading station "fly-thru," a state-of-the-art sight and sound package, and unique queue line and on-board entertainment elements. The GCII-designed Millennium Flyer coaster trains will zip through five belly-flopping hills and six high speed banked turns over 2,850 feet of track to create a ride that delivers the acrobatic thrills of a modern roller coaster while retaining the nostalgic look and feel of a classic "woodie." The Terminator franchise is a highly-successful series of science fiction films centered around battles between Skynet's artificially intelligent machine network and John Connor's Tech-Com forces and the rest of the human race. Since the debut of the first film in 1984, starring Arnold Schwarzenegger and written and directed by Academy Award winner James Cameron, the Terminator films have grossed over one billion dollars worldwide. Terminator Salvation™ is the upcoming fourth installment to the series and is scheduled for a spring 2009 theatrical release. The Halcyon Company owns all rights to the entire Terminator franchise. As producers, Kubicek and Anderson recently wrapped production on the film, starring Christian Bale, Sam Worthington, Moon Bloodgood, Bryce Dallas Howard and Helena Bonham Carter. 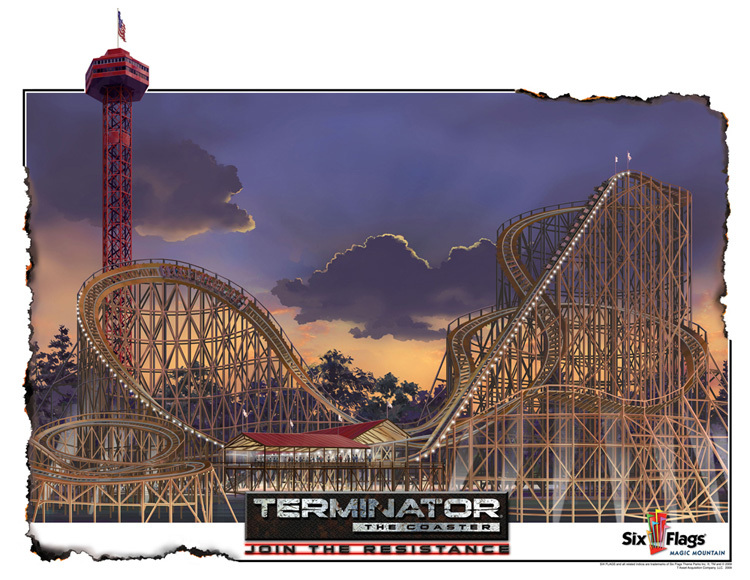 TERMINATOR®: THE COASTER will be located in the northwest corner of the park, next to Déjà Vu and is slated for a spring 2009 opening. With the addition of TERMINATOR®: THE COASTER, Six Flags Magic Mountain will be home to 16 world class coasters. Interesting it will be a woodie. Looks like the drop will be intense. This GCI looks infinitely to the 99th power better than Psyclone and hopefully it delivers a good ride like Kentucky Rumbler and be immersive with the sound system. While I still think a Terminator theme is a little out of place, it will probably grow on me. Cant wait to see the updates! Wow, this looks a lot better than the Evel Knivel clone I was expecting, and with how good Evel Knivel is, this is sure to be the best wooden coaster in all of Southern California, if not the entire state. This coaster looks like a lot of fun to ride, and that should make it a big hit with families. As for teenagers/thrill seekers, I see them disliking the ride because it won't be as big or intense as Goliath or Deja vu. One thing that I am interested to see is how they use the light and sound effects as I don't think it has been done on a wooden coaster before. I'm excited. That first drop looks amazing, has some serious potential. Looks like its going to be fun! I hope Magic Mountain is going to be kind enough to let TPR do a preview or some kind of event. A camp out or something. I will Definitely be first on that list. If not I will be there at least opening week. Can't wait. looks sweet and fast! I just don't understand the theme. When i think of Terminator i think of steel. Its that simple. Almost any steel coaster type would fit this theme better. But im not complaining, we get a new ride and thats awesome. That looks like the Crystal Beach Cyclone did in someway. Looks intense, fast, and unique. Looks kinda short, but still can't wait to see what happens. Is the lift hill going to really be that steep? And I hope the station will have more theming then that. But without doubt, I'm very excited for this. Looks awesome! Location: In a secret location. I wonder how unique queue line going to be. This ride will be a good addition for SFMM!